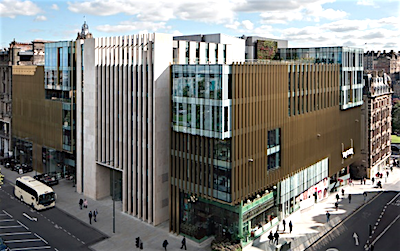 Standard Life Aberdeen, the largest active fund manager in the UK and one of Scotland’s largest employers, has officially opened its new headquarters at 6 St Andrew Square in the heart of Edinburgh. The new HQ was officially opened by The Princess Royal. “The nine-storey development has already invested £90m in the capital, and will generate a further £200m each year to the Scottish economy,” said Standard Life Aberdeen. Standard Life Aberdeen operates out of 50 locations worldwide with around 9,000 people — and about 1,000 of them are based at the new HQ. The 100,000 sq ft office building was developed by the Standard Life Pooled Property Pension Fund and joint venture partner Peveril Securities, along with 65,000 sq ft of shops, restaurants and appartments on the lower-ground, ground and first floors. All the space is fully occupied by tenants. Keith Skeoch and Martin Gilbert, co-CEOs of Standard Life Aberdeen said: “Welcoming The Princess Royal to Standard Life Aberdeen today was a great honour for our people, 21 years after she opened Standard Life’s previous headquarters. “With a rich and proud Scottish heritage, the business has evolved over the decades into a global organisation, whilst remaining at the heart of Scotland’s economy and business community. “The new headquarters is an initial £90 million investment in Edinburgh, but it’s not just about us. Standard Life Aberdeen’s asset management business, Aberdeen Standard Investments, is one of the world’s largest investment companies with more than 1,000 investment professionals and £575.7 billion of assets worldwide. Standard Life Aberdeen plc is headquartered in Scotland. It has around 1.2 million shareholders and is listed on the London Stock Exchange. The Standard Life Aberdeen group was formed by the merger of Standard Life plc and Aberdeen Asset Management plc in August 2017.